Annalee Doll Description: Last one. 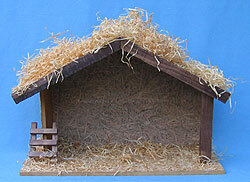 Wooden manger for Nativity. Fits 10" 6" and 4" size Annalee Dolls. 18" long by 12" high. Much of the hay is loose, please disperse where needed. Manger may vary slightly from photo.